Good for what ails you – Hello Korea ! Yesterday Y took one look at me and told me I looked sick and tried to convince me to go home. I protested, because I had heard that Korean teachers had to be on their death bed before they would take sick days off. 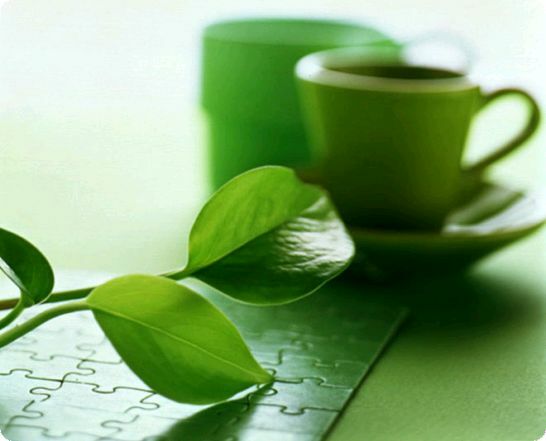 Then, she took the potted plant that she’d given me several weeks before and told me I needed a new one. I protested, because it wasn’t dead – just a little dry from the weekend and the flowers were spent. Despite my protests, she took the pot and returned after lunch time with a small potted flowering tree to replace it. This morning, I came in sounding worse than before. She took one look at me and told me I should go home. I protested that I sounded worse than I felt, and she tried to convince me to go home again. After which, she produced a jar of dark honey from New Zealand and told me I needed to add it to hot water and drink it. Later, another teacher asked if I was sick because I didn’t look too good, and again I told him I looked and sounded worse than I felt, and Y told me that I should tell everyone how sick I am – that way I will get sympathy and gifts! After my third class, she said she was convinced I was sick because I didn’t eat good. (she had been to my apartment for a minute and looked into the empty pre-payday refrigerator and was not convinced I could feed myself) So she said she wanted to take me to a place with healthy food for lunch, food that would make me feel better. So this was how I came to eat Samgyetang for the first time. I’d heard about it before, but didn’t know where or how to order it. 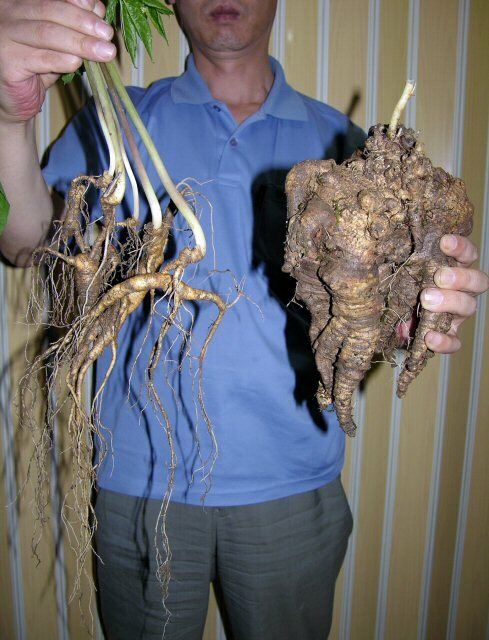 Nor was I a big fan of pure ginseng flavor, so couldn’t imagine it. But it was really good! Basically, it is a whole cornish game hen. It was stuffed with rice. And buried in the rice were four treasures: A whole jujube, which is similar to a fig or prune, a chestnut, a clove of garlic, and a chunk of ginseng. 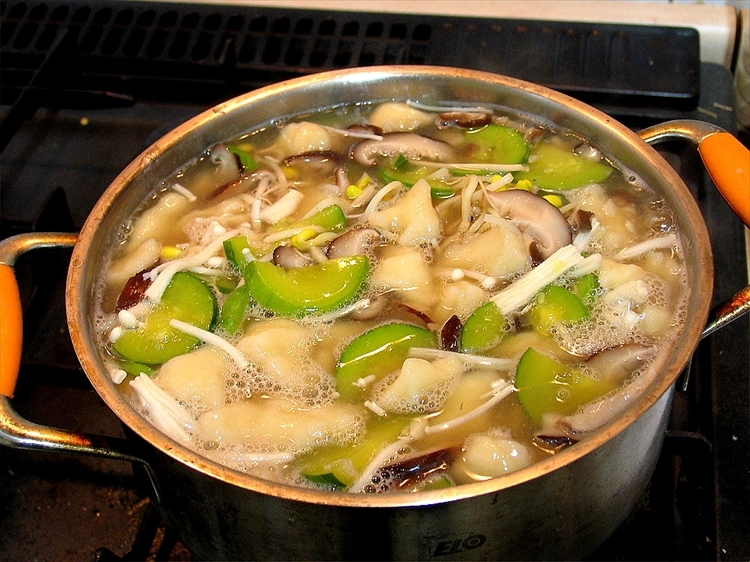 The broth which covered the chicken was rather bland like all chicken soup is, but somehow the added ginseng that flavored it gave it an interesting earthiness, and green onion floated on top for highlights. Bowls of salt, pepper, and red pepper is off to the side for you to season as you wish. As side dishes there were: a cold cabbage salad, hot green peppers and a red pepper sauce to dip them into, some kimchi, and some massively huge cubed radish kimchi. 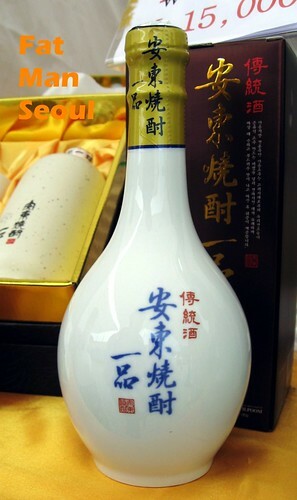 AND a shotglass of ginseng-infused soju with ribbons of ginseng floating in it. It was REALLY REALLY GOOD. I could swear it was lightly sweetened, but Y insisted it was just from the ginseng. During lunch, one of the topics of conversations was the Western preference for chairs. I told her we could sit on the floor – but we just didn’t know how to do that for a long time – maybe we were doing it wrong somehow. I explained how sometimes sitting like that cut off my circulation and I would get pins and needles. Y said that never happens to Koreans – they could sit like that for hours and hours – all day if they had to. On the way out, we were both laughing because her legs wouldn’t work due to pins and needles. In the car, I thanked her for the chicken soup and told her I couldn’t figure out if she was my friend or my mother. Oh! 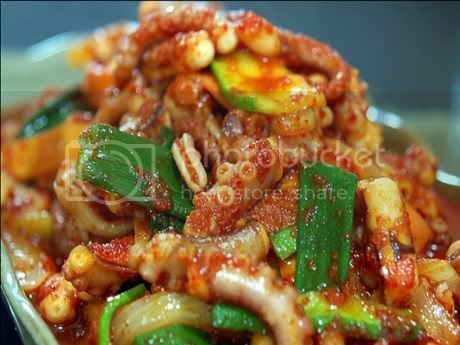 and while looking for the above photo, I stumbled upon the following website, which discusses some top 100 Korean dishes you gotta try and has photos of them. So here’s his top 100, cut and pasteed from his website, but the bolding has been changed to what I’ve had already. The ones in green mean I’ve had some other variation. The ones in red mean they’re on my list..
015. 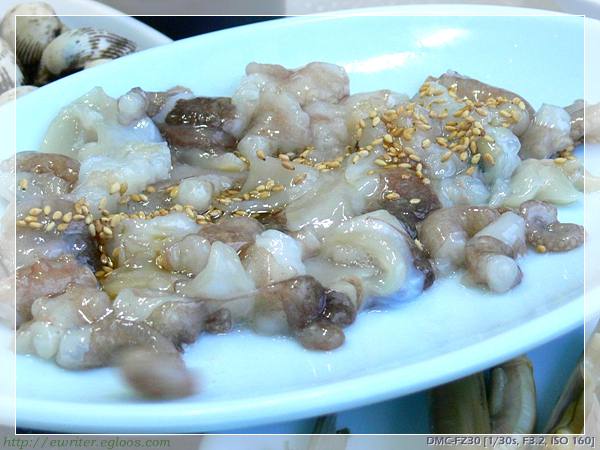 Gobchang Gui (Grilled Beef Intestines) 곱장구이 [photo] Okay – I’ve had the stir-fried Kochang, but not the grilled. 016. 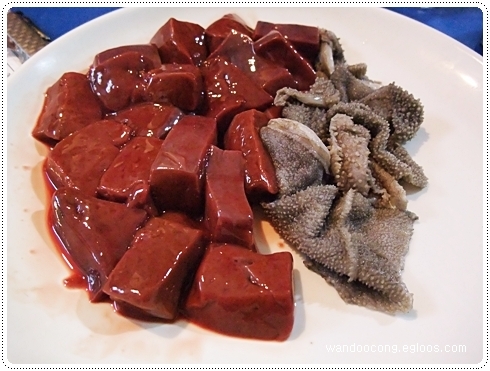 Seng Gan (Raw Beef Liver) 생간 [photo] Euuuuw! NOT going to have this raw! But I have had it cooked here. Not a big fan of liver. 023. 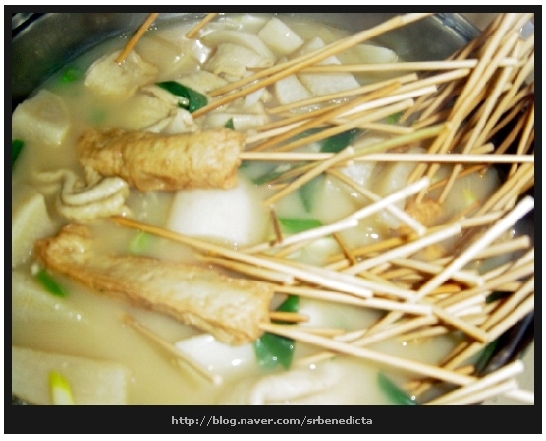 Odeng/Eomuk (Street-side Fish Noodles) 어댕/어묵 [photo] These are a lifesaver when you need a cheap, nutritious pick-me-up. Plus the broth they give you is like spinach to popeye. 028. Lotteria’s Shrimp Burger [link] Lotteria burgers are gross and over-rated. Kraze burgers are much better. 034. 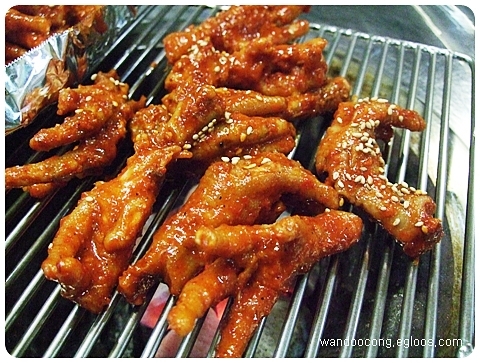 Ddeokbokki (Chewy Rice Cakes in Spicy Sauce) 떡볶이 [photo] This is kind of like spaghettio’s. Especially with parmesan cheese on it. 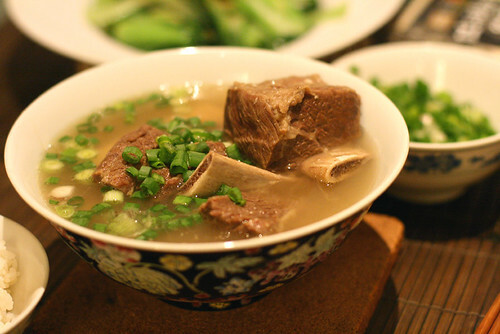 Most people (westerners too) love this, but I avoid it because there’s not much nutrition in it. 036. 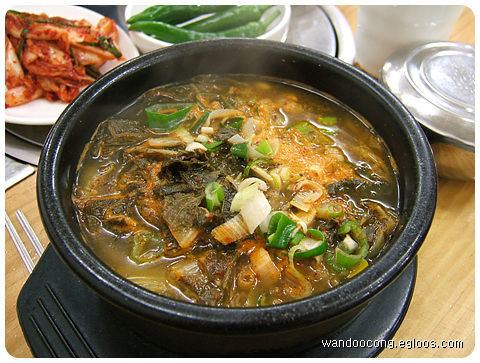 MiyeokGuk (Seaweed Soup) 미역국 [photo] I was told this was given to people on their birthdays. 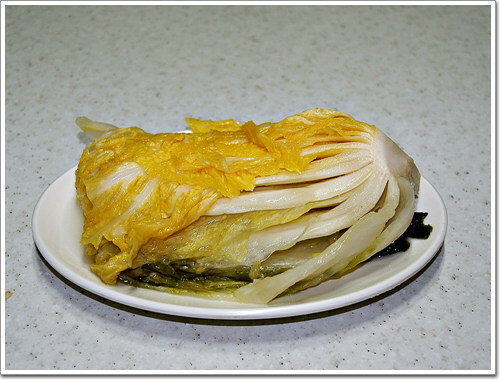 It’s very light and yummy. 053. 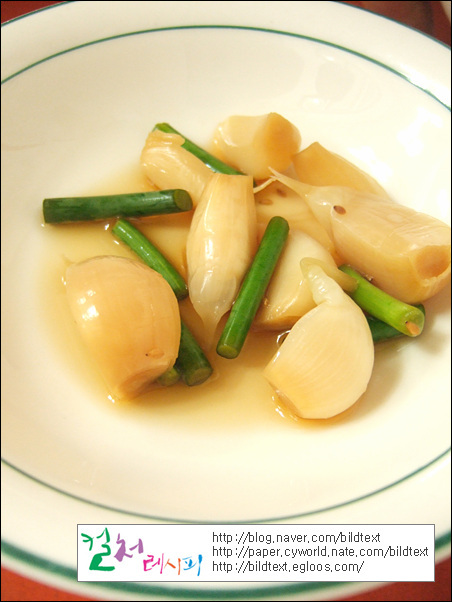 Dotorimok (Acorn Jelly) 도토리목 [photo; link] I LOVE that sauce shown in this photo – wish I could find some pre-made somewhere. It’s really good on tofu, so that’s why I’m thinking this acorn jelly stuff might be really yummy as well. 063. 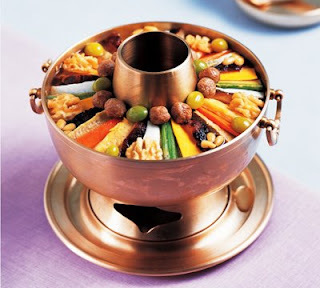 Dolsot Bibimbap (Mixed Rice and Vegetables in a Sizzling Stone Pot) 돌솥비빔밥 [photo] there are many kinds of bibimbap. This weekend I was really really happy to find my closest bibimbap restaurant served flying fish roe. It was the cheapest one on the menu, at 5,000 won – cheaper than the vegetable bibimbap even. But it was extra yummy. 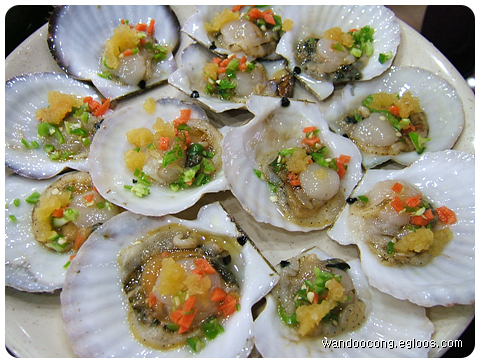 Not only do you have the crunch of the crusty rice but you also have the tangy pop of the roe. soooo good. 068. Shikhye (Sweet Rice Punch) 식혜 [photo] too sweet for me! OK. The links in this one post of his are a goldmine: I’ve only scratched the surface and discovered ZenKimchee; food as extreme sport . Sounds like a website my daughter would like. Has interviews and recipes in it as well. I’m not sure I agreee that these are the top 100, but I thought it would be fun to see what I’ve eaten or not. Oh – and Myung-Sook, it looks like I’ve been having Nurungi, not Shikhye every day. I’m sick as a dog myself–have been for a week, blowing my nose and coughing up stuff–and none of my colleagues has even offered me a kleenex, let alone delicious Cornish game hen soup. Don’t look now, but it sounds like you might have some real friends there. yes, I agree – and I’m sorry you’re sick too! I’d give you some kleenex…I have a year’s supply given as a house-warming present. it’s 4 am, so i’ll write more about this complex topic (yes, it is!) tomorrow. 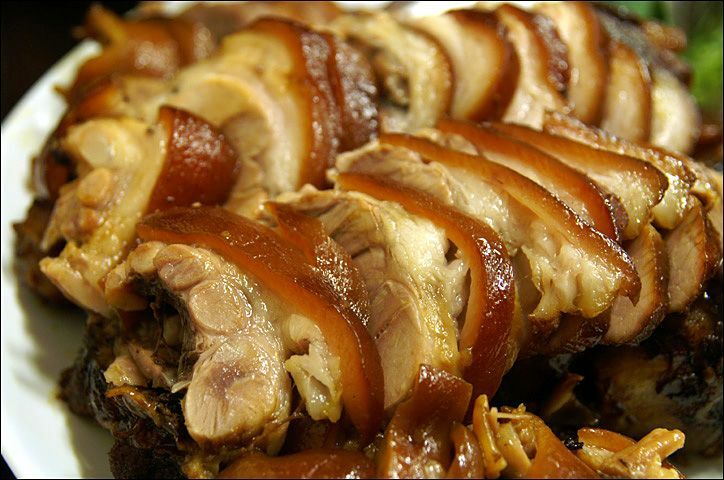 I love to try new foods for many reasons, but I’ve gotten over the bragging rights and the food-or-other-sensual-experience as novelty that shows like No Reservations or Bizarre Foods endorse. But I do want to add that many foods we consider normal staples are considered bizarre and disgusting by millions: CHEESE, for example…. Show a slice of expensive, European funky cheese, flowering with blue-green mold with an “earthy” aroma to most Asians and they’ll look at you like you’re crazy!!! Nah, I’ve said many times that these aren’t the TOP 100. It was tough to narrow down what got cut out of the list. 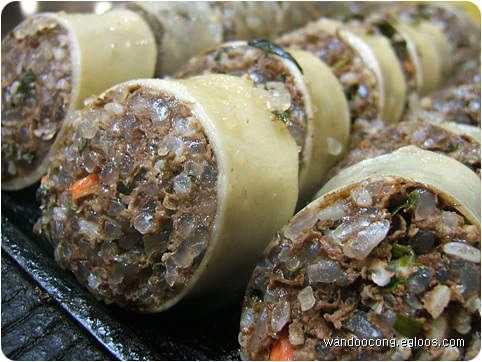 But by trying all 100, you get to better understand the many aspects of Korean cuisine. Hey! Honored you stopped by. So what ARE your top 100? 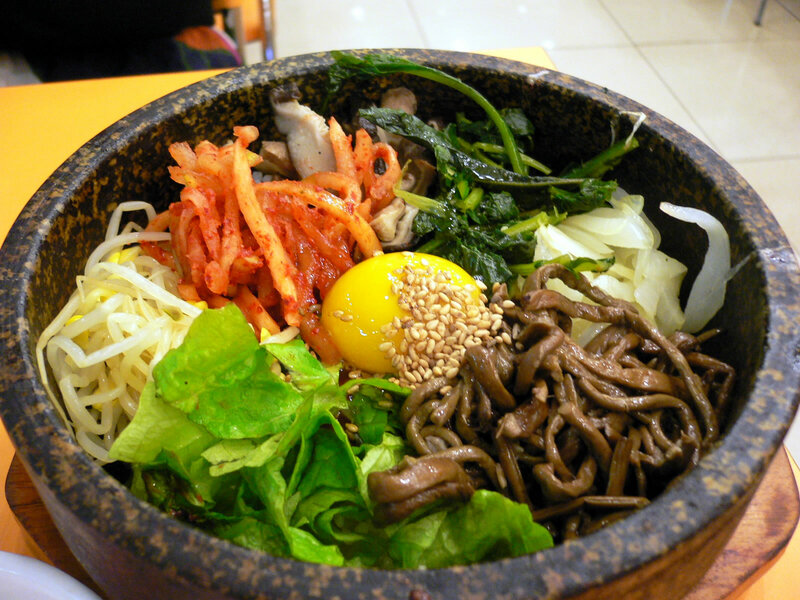 Mostly I need help in what SINGLE PEOPLE can order at restaurants – a person can only eat so much bibimbap!